VR Zone has details about the Intel Z77 and H77 chipset's Smart Response, Smart Connect and Rapid Start technologies, you can read the details over here. With the introduction of its new 7-series chipsets – specifically the Z77 and H77 as well as a few mobile variants – Intel will be adding two new technologies in addition to Smart Response. These two new additions will be known as Rapid Start and Smart Connect and the requirements have now been detailed courtesy of Asus' manuals for its upcoming motherboards based on the new chipsets. 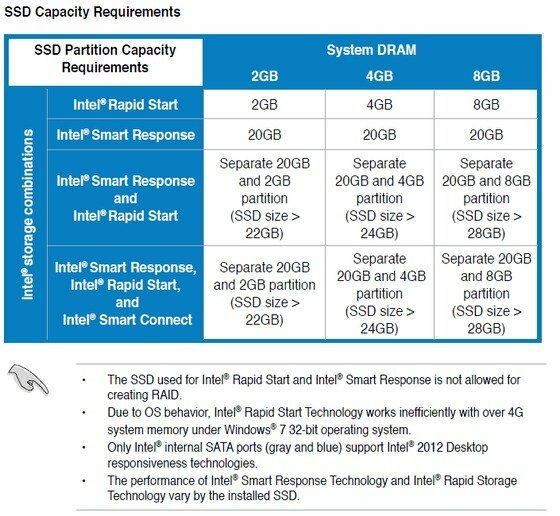 As previously, Intel's Smart Response will require a minim of 20GB of SSD space and nothing has really changed from the Z68 chipset here. However, in addition to the 20GB of space needed for Smart Response, Rapid Start will consume an equivalent amount of SSD space to that of how much RAM you have installed in the system. Asus is listing 2, 4 and 8GB, but we'd presume if your system has 16GB of RAM, you'll need 16GB of spare SSD space.